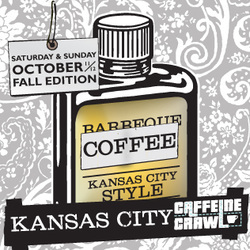 In a city so full of excellent coffee you need not one, but two city-wide events to explore it all, Kansas City brought the magic back again for Caffeine Crawl KC - Fall Edition 2014. Saturday dawned warm and sunny, with Crawlers scattered across the metro at different starting points. Our first sips of the day included brews from Messenger Coffee at Black Dog Coffeehouse alongside artisan toast, and a tasting trifecta and presentation of Guatemalan Cup of Excellence varietals from Finca El Socorro at PT’s Coffee at the Crossroads. Kaldi’s invited us “behind the bar” with a brew-your-own Ethiopian set-up and plenty of baristas for consultation. Thumb-print cookies offered sustenance, and a lucky Crawler took home his very own Kalita Wave brewer on which to use his new found skills. Parisi pulled all the stops with a science-meets-coffee approach, and Crawlers watched, drooled, and tasted as Kate and Reagan turned coffee into caviar, carbonated plums, and finished off the tantalizing coffee deconstruction with pomegranate pop-rocks and a great deal of pizazz. A Kenya Ruarai AB has never before been so fascinating. Coffee wasn’t the only thing in the limelight, and as the weekend progressed we savored truffles and popcorn from Annedore’s, a behind-the-scenes tour of Andre’s new space along with chocolate and espresso shots, and a completely astounding Toddy custard from Foo’s, topped with Christopher Elbow citrus bark and bewitchment of the taste buds. We are still collectively recovering from the marvel. Broadway welcomed us to their captivating roasting space with an old-world feel and an array of tasting sensations. Three single origin brews set the stage for a build-your-own blend take home treat, and local collaborations included Toddy rootbeer, Toddy ice cream, and Toddy-cream filled eclairs. Kaldi’s mixed things up for their Sunday presentation with espresso macchiatos, and Hi Hat sampled the taste of autumn with a nutmeg and maple latte before somehow squeezing us all inside their tiny, quaint space for a Caffeine Crawl group selfie. Homer’s had brews and baked treats to share, as well as awesome local band Attic Wolves live on stage and plenty of good vibes as Crawlers mingled and sipped. Oddly Correct took comparison brews to the next level with the same coffee roasted to different degrees. We slurped, considered, and asked lots of questions, and they happily obliged. Crawlers got a taste of the barista life at About the Coffee as they pulled their own shots, learned how to steam milk, and drank the lattes of their labor in the fabulous front room of ATC’s new space. Things heated up at the After Party at Benetti’s Coffee Experience with an arcade-style latte art throwdown, local coffee beer collaborations with Martin City Brewing Co. and a home roasters round up. Crawlers who had caught the barista bug got a chance to play on a custom Barista Nation Stella di Cafe espresso machine by Unic, and we rifled through our event bags, brimming with goodies from Barista Magazine, Missouri Bank, Wholesome Sweeteners, Yelp, Regal, Espresso Parts, Rip Van Wafel, Cafe Nearest You, and Print Time. After a great night of sipping, pouring, tasting and talking, we soaked up every last bit of KC’s coffee community goodness and headed home. It was a weekend to remember, and we can’t wait for next year!